Ben Dalton is a computational design and experimental media researcher. He is currently on research leave from the Faculty of Arts, Environment & Technology at Leeds Metropolitan University, to join The Creative Exchange hub and a PhD at the Royal College of Art. He has recently been a guest Professor at the Bergen National Academy of Art and Design, teaching workshops on interaction design. He has a background in ubiquitous computing and mobile sensor networks from the MIT Media Lab, and has conducted research in the Århus University Electron-Molecular Interaction group, University of Leeds Spintronics and Magnetic Nanostructures lab, and Jim Henson’s Creature Shop, London. 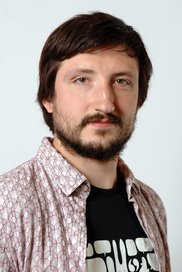 Ben is just completing work as co-investigator on two EPSRC funded research projects in to visualising pedestrian usage patterns in interactive urban spaces and wearable computing sensors for ubiquitous computing applications. He is currently collaborating on a project titled Data is Political on art, design, and the politics of information, which included an international symposium funded in part by VERDIKT (Research Council of Norway ICT grant). He has also worked on Hewlett-Packard funded development of a GPS music city archive app presented at the FACT gallery Liverpool and the ICA gallery London, and with arts innovation funded grants including ARTiMELT, an Arts Council England supported residency. "inspired centers of civic life"
I have been thinking about my reading of "digital public space". I like how the perspectives I bring shift as I emphasise different words within the phrase. If I read with emphasis on pairs of words I draw on different associations, for example 'Public Space' and 'Digital Public'.